58 Min. & 75 Min. 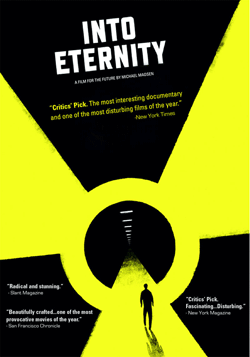 With its stark, stylistic approach, INTO ETERNITYnot only raises questions about the possibility of long-term nuclear waste storage, but also invites reflection on the limits of science and human knowledge, along with our responsibility to future generations. "CRITICS' PICK. I am tempted to call Into Eternity the most interesting documentary, and one of the most disturbing films, of the year so far... the way the movie and the people in it express their concern gives it a feeling of sublimity unusual in most environmentalist documentaries." "It might seem crazy, if not criminal, to obligate 3,000 future generations of humans to take care of our poisonous waste just so that we can continue running our electric toothbrushes. But it's already too late to wave off the nuclear age, and Mr. Madsen's film comes at a perfect time to join a worldwide conversation about what to do with its ashes." "Excellent. The haunting Into Eternity...is a rare hybrid: an information-packed documentary crossed with an existential art film. In a deceptively low-key manner, Danish filmmaker Michael Madsen has beautifully crafted one of the most provocative movies of the year." "Tackles a subject almost beyond comprehension .... one of the most extraordinary factual films to be shown this year. Why isn't every government, every philosopher, every theologian, everywhere in the world discussing Onkalo and its implications?" "Recommended. What animates the film is the other worldliness of the under-construction project, and the paradoxes the finished Onkalo will embody. If Onkalo succeeds, it will become the longest-lasting product of contemporary civilization - which it might very well outlive."